Last year we explained what Halloween (Hallowe’en) was and some curious facts about this festivity whose popularity is growing every year. Today, we’d like to present some educational resources related to Halloween that will allow you to improve your level of English and learn something else about this date. Let’s begin with related vocabulary like: bat, bones, broom, candy, cemetery, coffin, costume, creepy, frightening, ghost, goblin or haunted. You can see the complete list in Vocabulary - Halloween. If you don’t know the meaning of all the words, help yourself using a free online dictionary. 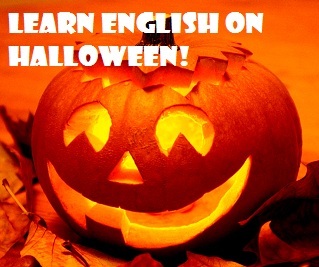 In the following link from English Page, you’ll find a lesson with vocabulary about Halloween along with the definition for every word. Moreover, they also offer a section with adjectives for Halloween. In order to practice your knowledge about Halloween and its related vocabulary, you can do this test, this one about Little Monsters, or another one that includes adjectives for Halloween. If you are a teacher looking for printables (in pdf format) with pages to colour, word searching and many more, don’t hesitate to visit MES-English where you’ll find loads of free printables. After this intensive learning you can consider yourself as an expert in terms of Halloween and its related English vocabulary. Why don’t you test your knowledge with the Hangman game?